Started in March 2004, there will be a new "joker of the month" added to this xpo each month. The shown joker presents the best one that came to us in that month. Each year we'll start with a clean sheet, but previous years will remain on xpo. Although it was a very slow month for trading, we could still afford to buy some nice old and modern decks. A few came with a joker, but the chosen one wasn't among them. It's something that we hardly do anymore, but this month we bought a few single jokers on Ebay. This joker came in a lot of 9, of which only 2 others were new to us too. The back is a factory back, but with no mention of maker. Judging by the 4 circles in the corners, we think it will be an older Grimaud joker. Maybe from the 1920's, when these kind of joker figures were published by other manufacturers too. Maybe one of our visitors here can provide more definite information and we'll be happy to share that here then. The joker must be a bit rare, because we had never seen it before, and we've seen a lot of jokers over the years. But there's something odd about this figure too. It seems as if his head has shrunk, as it's too small in relation to his body. Anyway, although not in perfect condition, it's still the best one of this month for us. We received a few modern decks with jokers and bought a few single jokers on eBay again, so we had a nice number to choose from. We picked this one, because it had been on Miriam's wish list for a long time. 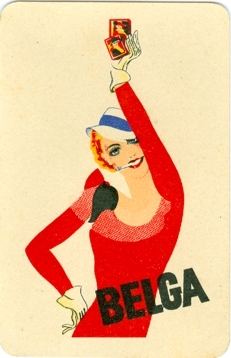 We have the later "blue sister", also an advertising joker for Belga cigarettes. Miriam hardly ever comes to a collectors meeting any more, so she can't personally go through all the dealers books with jokers there, and Joop is more interested in the decks on offer. It's one of the reasons that it has taken such a long time before we could add the "red sister" to our collection. The other reason is that somehow she's more difficult to find. Brings us to a question: is a joker without the word joker on it a real joker or is it just an extra (advertising) card? We would answer that with a yes to the extra card. 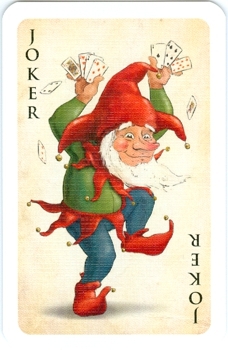 However, among joker collectors here in Holland and Belgium there are a few cards that are considered as jokers, even when there's no "joker" (or corner stars). This is one example, another one that springs to mind is the Dutch Perry joker with the coachman and coach. 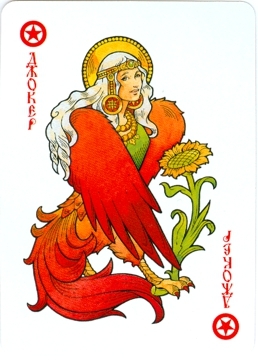 For this Belga joker can be said that her younger blue sister does have the word joker on it. Maybe that was added to end any confusion. 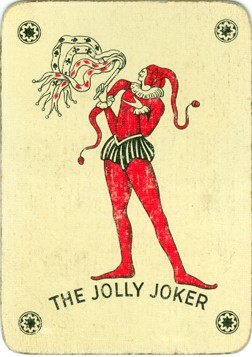 This month we have bought only 2 single jokers, but we did acquire a good number of decks and, although most of them were antique decks, all the modern decks had jokers. There were even 2 decks that we had bought specially for the jokers. One of them was a French deck by Banco from Paris, of which we had the coloured version of the joker, but found that there should be a b/w version in these decks too. We've shown them both in a post on Facebook. We also bought a Belgian deck, advertising St. Michel cigarettes, specially for the joker. We have been looking for a long time to find this joker at an affordable price. Usually joker collectors ask quite a price for this joker. Now we found a seller on eBay, who offered a complete deck for not nearly the collectors price. We have had an other St. Michel joker for years and at first glance it looks the same. But of course there's a difference. One might even argue that there are 500 million differences. 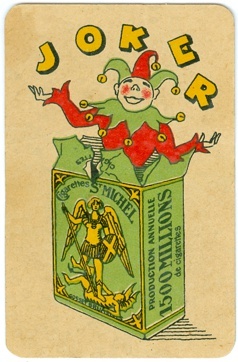 Along the side of the cigarettes pack the annual production of St. Michel cigarettes is mentioned. 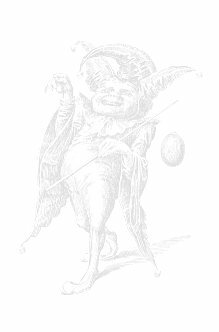 Obviously this newly found joker is older than the small inset joker, that we already had. The annual production has gone up from 1500 million to 2 billion a year. So a rare variation this month. It was a terrible month for jokers. We have acquired an antique transformation deck this month (see our Deck of the Month) and that required most of our playing card funds. 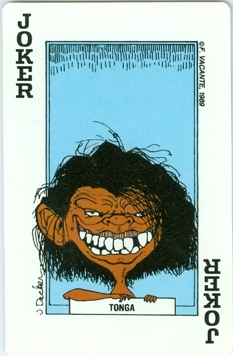 And even worse..... that deck was never published with a joker! So most of the month was spend looking at eBay decks that we couldn't afford at that moment. Fortunately there was a package from the US, containing the Gemini decks that we had helped funding on Kickstarter and that had been paid already. So why not show a joker from those decks? There were 3 jokers with this deck and two were fine enough to be shown here, but we chose to go for vintage and rare this time. So this month we show you a rare French joker, that we were able to buy on the French eBay at a nice price. It's rare because the joker originally came with a deck, that was published as a commemorative deck of the Tour de France of 1960. 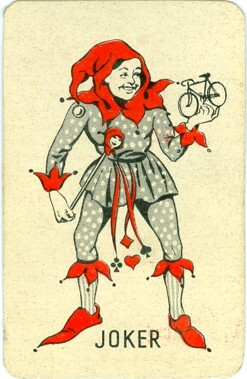 The deck has 52 cards, an extra card with the route of that Tour de France and this joker. We have the deck and joker in excellent condition, so it's not an improvement of our collection and this joker here will be traded. The regular version of this French joker by Catel & Farcy is already not that often seen anymore, but in this rare Tour de France version the joker figure holds a bicycle and that's the what makes this joker special enough to show it here. May is the month in which Miriam celebrates her anniversary. This year no big party, but just an intimate dinner for two at a nice nearby restaurant. There were not that many decks to choose from and not all of them had jokers. A slow month for our eBay sales means that we have not that much money to spend on playing cards, nor on eBay nor on other auction sites. But with some clever bidding and a lot of luck we managed to get a few new nice additions for our collection. No single jokers this time to help here. One of the decks that we could acquire was an Italian deck called Carta Portofortuna. It came with an explicative notice in Italian, which seems to explain the use of this deck for fortune telling, but didn't mention a maker or designer or year. So there's nothing else to tell you here except that the deck has 52 cards and it comes with 2 jokers. 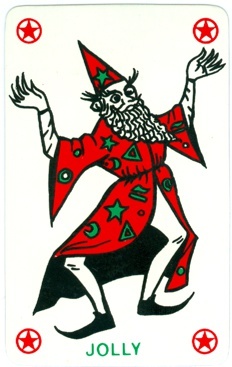 They show the same magician, but the other "jolly" has a green cape and black corner stars. We chose this one. It was a bit of a hectic month, with friends coming over or we visiting friends. There were two playing cards events. The first was the Collectors Day at the National Playing Card Museum in Turnhout. Sadly we couldn't attend the meeting of Dutch collectors in Kerkdriel this time. Miriam couldn't attend, but was well enough to be left alone at home for the day. In Turnhout Joop picked up a few new decks for our collection. They were all modern decks and they came with jokers. So there was at least a number of jokers to choose from. The internet brought some very nice decks too, but those were all antique ones and never came with a joker. So a modern joker again. This is one of two different jokers that came with a new Russian deck from 2016. It's titled "Slavic Mythology". The deck was printed by Nage Cards from St. Petersburg and published by Az-Art. The wonderful designs were done by Mila Losenko. ENJOY! Again it was a busy month. Joop visited 4 open air markets and although he brought home a rare Dutch single joker, an evenly rare Dutch advertising deck and a few other interesting decks, he didn't find anything new for our collection there. However the weather was fine and he enjoyed strolling along the stalls in the morning sun, even if that meant setting alarm clocks and short nights. We had - for Miriam's standards- quite a busy social life this month. Sadly there was not much time to spend in the garden, the last two weeks there were frequent showers between sunny periods. But Facebook keeps us both busy too and sometimes it leads to acquiring a new deck. In the Playing Card Collectors group someone posted a nice new deck from New Zealand. Going to the linked website we saw another one that we also liked, so we ordered both. This joker comes from the "Hello Tiki" deck by Montenzi.NZ from Auckland. 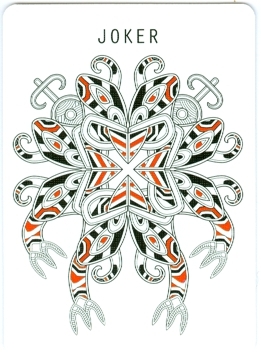 It has an intriguing design with all kind of Maori symbols. Because there were not many new decks added, the other deck, which was published by Montenzi.NZ as "Haere Mai" ("Welcome" in the Maori language), was chosen as Deck of the Month. And of course you are "haere mai" to visit that page. There were two antique markets that Joop visited. Both brought us some nice surprises. Although one wouldn't expect to find this at an antique market, but one of the surprises was a rare single joker by the Speelkaartenfabriek Nederland, but we already had that variation of the little farmer. Ebay brought us some decks and some of them had one or more jokers. The French non-standard advertising deck for Adidas had 2 similar, but nice jokers and there was a new non-standard Heineken deck with 3 similar, but nice jokers. Ebay also brought us a nice single joker that we bought from a Dutch collector, but there's another Dutch collector who is also selling jokers on eBay and he offered the joker that was chosen this month. The joker comes from a deck that was made by Viby from Denmark. The company only existed for a short while, so the joker can be dated as 1952 or '53. And because it was a small company and only in production for a short while..... a rarely seen joker! This month was a bit hectic again. Our 19 year old cat had fallen down the stairs and was limping a bit. Two vivists by the vet and twice a last farewell was considered, but fortunately not put to practice. It was a slow recovery, but now he's running around again, although he has never set foot again on the second or third floor. Then there was the IPCS convention in London that we had to skip at the last moment. Of course Joop had hoped to find some nice additions for our collection, preferably complete with jokers, but his presence at home was more needed than in London. There were no interesting flea or antique markets this month, meaning large enough to spend at least a few hours there. Joop isn't visiting the small local markets any longer: wading through second hand clothes, in and out within 30 minutes and usually empty handed. So there were not that many jokers to choose from this month. There were 3 modern decks from Australia, that had jokers and one of them would have qualified for this spot, but we chose this one. The joker was a gift from a befriended joker collector, when she and her hubby came over to play cards. The deck was published here not so long ago by a Dutch lottery organization, but probably printed elsewhere. There was only one market that Joop visited and he came home empty handed. However, in the first two weekends in November there will be two large collectors fairs and he's already looking forward to them. Over the years those fairs have provided some great finds, but even when they only bring average decks, it's a pleasure to walk around, as the offer of collectables and antiques is of good to very good quality. So we received many packages in our mailbox this month, as the internet was the only place that provided decks to trade and decks for our own collection. Most of the latter were old or antique ones and no joker was issued with them. In fact there was only one deck that was published with a joker, so there was no competition and no choices to make. 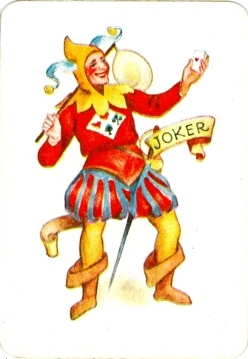 The joker comes from a deck that was published by the FDB, a Danish consumer chain, as "All Brittish Playing Cards" in 1933. The deck was printed by Alf Cooke/Universal Playing Cards. The designs were done by Bogelund. It was a busy month with two large collectors fairs in two consecutive weekends. It meant getting up early to be there at about 8 AM each day, but it was nice to stroll around because the goods on offer were of good quality. Only a few stalls with vintage clothes and the rest of the stalls were filled with collectables, antiques and vintage stuff. The first bourse already brought us some great finds, but we did our best find since we had started collecting during the second bourse in the Jaarbeurs. So make sure to check out our Deck of the Month too. Ebay did bring some very nice decks for our collection too, but all our good finds and wins were were antique decks and didn't come with a joker. It's not that we didn't buy any modern decks, but the jokers weren't that interesting. Except for one! This little fellow stole Miriam's heart the first time she laid eyes on it. There are 3 of them, all the same, in a deck that advertises a Belgian beer called La Chouffe. The courts are depicted as gnomes too, each holding a glass of beer. The deck was printed by Cartamundi and published by the end of 2016. Always a busy month with the holidays and so on. We didn't acquire many new decks, but halfway this month we had a collector friend and her hubby over to play a game of cards. She had brought her book with duplicate jokers and Miriam had a go and bought some 25 jokers. Of course the next day she found that there were 6 that she already had. Oh well, it's hard to remember about 10.000 different ones, so these things happen. So during the last week of this month we thought we would pick a joker for this spot from the newly acquired ones. 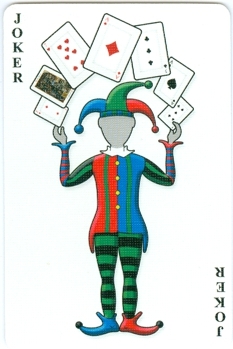 We did and it had already been scanned and converted, when we received a deck of cards with 3 jokers. Two similar ones and this one. We immediately liked it better than our chosen one, so a last moment change was made. 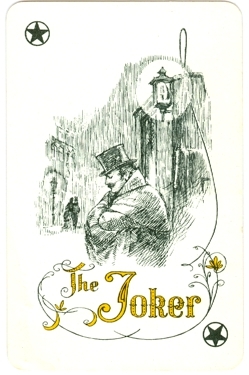 The joker comes from a Sherlock Holmes deck that was printed by Gemaco and published by Vacante in 1989. The courts are non-standard and show portraits of characters from the Sherlock Holmes novels by Sir Arthur Conan Doyle. The designs were done by J. Decker.